frankly my dear...: The Pattern. A couple of you have asked about the romper pattern that i used to make the pretty little girl's romper with. 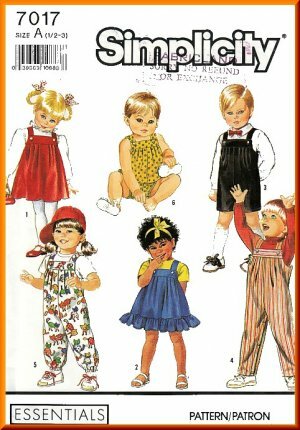 I was lucky enough to find this pattern at an oppy a couple of years back, it also includes a pattern for longer overalls & a cute pinnie too (which i made for Scarlett here in this post). You can't quite see the detail in the photo of the romper i made, but it has pleats at the front & the back. Best thing is it's really quick & easy to whip up - i have made quite a few pinnies & rompers from it already. I know if i was a baby, i would be quite happy wearing one of these rompers on a warm summer's day......or even a pinnie with tights in cooler weather. If you're lucky you might be able to find this pattern on ebay. When you come visit me next I will show you some old womans weekly things mum was going to toss. I still have not had a chance to go through all the patterns she gave me. Ooooh i can't wait - your mum must have some awesome treasures! Family, sun & lots of fun!